Following on from the successful Disobedient Objects exhibition, the V&A has worked with the Disobedient Film Company to release an experiential documentary film called London Recruits: the Secret War Against Apartheid. 1960s and 1970s apartheid South Africa saw anti-apartheid leaders like Nelson Mandela jailed or killed for their resistance to a racist regime. African National Congress activists such as Ronnie Kasrils were exiled abroad – often to London. These exiles recruited young men and women from university and activist circles to carry out secret missions in South Africa. These clandestine efforts included everything from mailing letters to smuggling arms to detonating leaflet bombs in areas black South Africans would congregate after work. 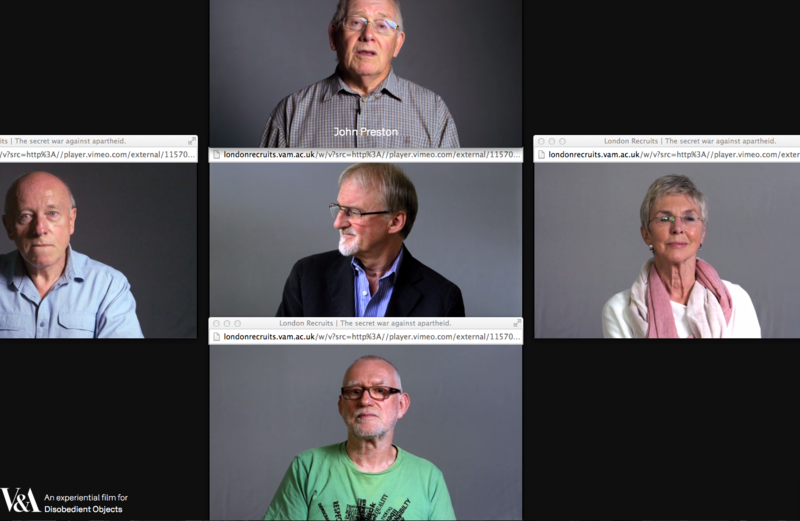 Featuring interviews with those who took part in the anti-apartheid campaigns, from the printers of the leaflets to the people who set off the leaflet bombs, this immersive and interactive film takes viewers across multiple parallel narratives. Browser pop-ups echo leaflets released in leaflet bombs and dedicated viewers are rewarded with a number of hidden stories, picture and poster galleries and photomontages from Peter Kennard. Viewers can either watch all of the narratives, or select a particular strand. Any chosen route takes the viewer to a leaflet maker to write their own message and share it with friends and other viewers. Taking their name from the exhibition, directors Leah Borromeo and Katharine Round and interactive director Gilbert Sinnott wanted to challenge a viewer’s engagement with history. The filmmakers created a bespoke ‘back-end’ for the film, as well as carrying out finely executed re-enactments and re-creations articles in it. From finding the man who printed the original flyers to re-creating those flyers on the same paper stock and on the same model of letterpress machine to meticulously making and detonating leaflet bombs themselves, the Disobedient Film Company sought to be as true to the London Recruits’ original stories as they could. The process of creating the film is documented on the Disobedient Film Company’s Facebook page. 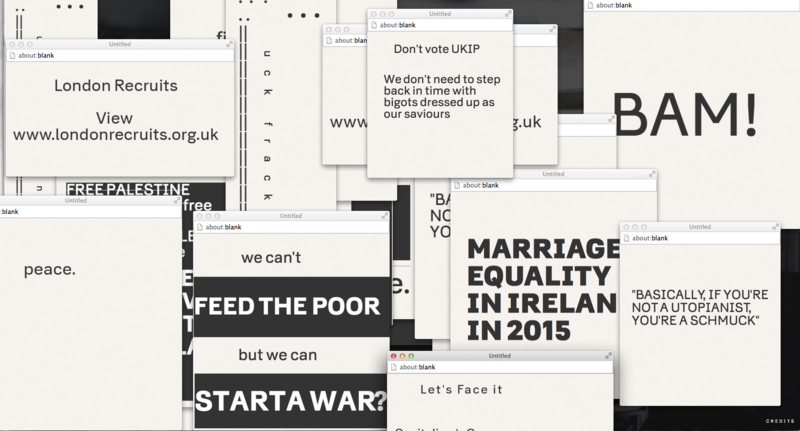 Disobedient Objects ran at the V&A until 1 February 2015. It was first exhibition to explore objects of art and design from around the world that have been created by grassroots social movements as tools of social change. From Chilean folk art textiles that document political violence to a graffiti-writing robot, defaced currency to giant inflatable cobblestones thrown at demonstrations in Barcelona, to a political video game about the making of mobile phones, Disobedient Objects demonstrated how political activism drives a wealth of design ingenuity. The exhibition presented objects mostly produced by non-professional makers, collectively and with limited resources as effective responses to complex situations.